Gardner's Photographic Sketch Book of the War. Plate 63. Here is represented the deserted quarters of Gen. Sharp, Chief of the Secret Service of the Army of the Potomac, at Brandy Station, Virginia. The tents have been removed, and the sketch depicts the scene when the camping ground, which had been occupied by headquarters during the winter, is being abandoned for the spring campaign. In the back-ground are the stalls for the staff horses, and the stockade or “bull pen” for prisoners arrested by the Provost Marshal General. The photograph possesses interest only as an illustration of the mode of life of the army in winter. No sooner is it known in camp that the quarters are likely to be permanent, than every man commences the erection of substantial quarters, which, in the winter season are made as comfortable as any village. 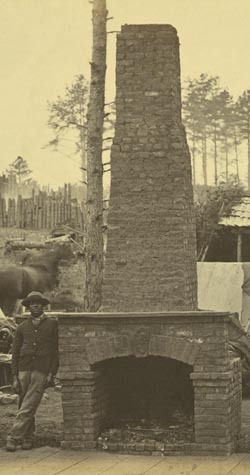 Floors are laid in the tents, log huts are built, and their inner walls neatly covered with illustrated papers, and chimneys with capacious fire–places erected, rendering the winter home of the soldier, if not desirable, at least a very pleasant residence. Storms and frost are unheeded, and the long evenings pass in mirth, with no care for to-morrow’s hardship or future perils. The snake hath made his poison vine. Hoots his nightly gloom constant guest.